Tektronix, Inc., the world's leading manufacturer of oscilloscopes, recently announced SignalVu-PC software that provides in depth, offline analysis of complex signals captured using Tektronix real-time signal analyzers and oscilloscopes including the breakthrough MDO4000, the world's first mixed domain oscilloscope. Available for Tektronix oscilloscope and real-time signal analyzer customers, SignalVu-PC simplifies validation of wideband designs and characterization of spectral events, and speeds up time-to-insight by showing the time-variant behavior of RF signals. It meets the market need to minimize test budgets while at the same time performing deeper analysis than ever before. "SignalVu-PC is the ideal solution for engineers who gather data in the field for later analysis, or who need to free up instruments in the lab for new tests," said Jim McGillivary, general manager, Source Analyzer Product Line, Tektronix. "It's also ideal for educators who need to teach complicated concepts like multiple domain interaction without incurring a lot of expense. Using SignalVu-PC, waveforms captured on low-cost MSO/DPO2000 Series oscilloscopes can now be analyzed in new and sophisticated ways." 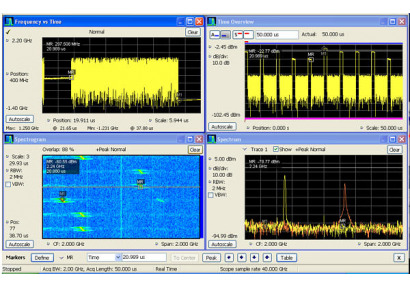 SignalVu-PC software offers extensive vector signal analysis functionality spanning spectrum, spectrogram, and RF measurements including analog modulation analysis, adjacent channel power, CCDF, occupied bandwidth plus amplitude, frequency and phase vs. time. Options for more advanced analysis functions are also available including modulation, pulse, settling time, audio and flexible OFDM measurements. Acquisitions from all current Tektronix MSO, MDO, DSA and DPO Series oscilloscopes, including the spectrum analyzer in the MDO4000 can be analyzed with SignalVu-PC, adding deep analysis capabilities to these broadband acquisition systems. Signals acquired with real-time signal analyzers can now be analyzed offline using the same post-acquisition analysis capabilities available with the instruments. Up to four channels of input can be captured simultaneously when using oscilloscopes. Each of the channels including RF, I and Q, or differential I and Q inputs can be independently analyzed using SignalVu-PC software. Users can also apply math functions to the acquisition prior to analysis. Acquisition lengths vary depending upon the selected capture bandwidth: full-bandwidth acquisitions can range from 1ms to 25ms depending upon model and option selections. Real-time signal analyzer captures range from up to 7 seconds at maximum acquisition bandwidth to several hours at reduced bandwidths. A free 30-day trial download of the full software package, including all options, is available now. The base SignalVu-PC software package is available for $1,990 per seat. Options for General Purpose Modulation Analysis, Advanced Pulse Analysis, Frequency and Phase Settling, Flexible OFDM and AM/FM/PM/Direct Audio measurements are available for an additional fee. Qualified educational facilities can cost-effectively use SignalVu-PC in teaching environments. Licenses are available to deliver SignalVu-PC software packages at an educational discounted price. Education versions include watermarked results.